Hi, my name is Eden, and being a Young Adult Programmer is my dream job. I’m still a teenager at heart. Okay, I just turned 25, but really, I enjoy all of the same things that your teenager does. I’m an otaku: that means I’m obsessed with anime, manga, and Japanese culture in general. I’m a gamer: I can talk gaming systems and the latest Mass Effect, I play Magic: The Gathering and have a collection of Yu-Gi-Oh cards at my work desk. I love reading: Young Adult dystopian literature, science fiction and fantasy, and cookbooks are my favorites (see Library catalog to put items on hold). 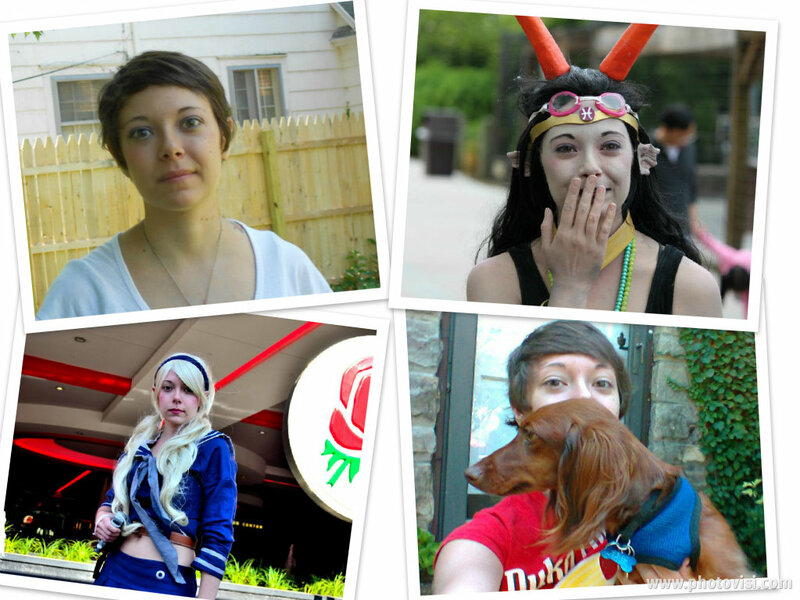 I’m a cosplayer: : I love designing and sewing anime and video game costumes and crafting props and accessories. I’m a baker: I will make dozens of cookies to relieve stress. I started as the Young Adult Programmer at the Erlanger branch on October 8th. It’s been a crazy month since then! I have to give some thanks to Jessy Griffith from the Durr branch for being a super cool mentor and helping get me into the swing of things. I am also very excited to work with Erin DeSantis, the YA Librarian at the Covington branch, starting next year. Those two have some awesome programs and do really great things for their branches. Recently some of my program regulars have been asking about what I do at work besides run Teen Space. I just can’t even describe it all. When I leave for work in the morning I have a unique checklist: Harry Potter lunchbox, YA dyslit to check-in, Magic decks, anime magazines, keys, nametag, manga posters. Seriously, I have the best job ever. Most of what I do involves planning and running programs for teenagers and preteens and overseeing the development of the YA collection. Teen Space is my regular program; it runs every Monday and Wednesday from 4-6 pm. We play video games, card games, board games, look at manga and magazines , use laptops, and just hang out! Once a month we have ErlAnime, Erlanger’s anime club, Teen Movie Night, and a craft program. Chess Club is every Tuesday from 3:30-5:30, and my teen writing group, The Word Processors, meets two Thursdays a month. These are just the regular programs that always happen. There are a ton of new programs and special events coming up that I am super excited about. Beyond the Book is my new teen book club. All pre-registered teens for January will get a free copy of the month’s book, “What’s Left of Me,” by Kat Zhang! Manga Club will start in January, it’s basically a book club focused on manga. RPG Game Night is also beginning in January, where we’ll play card and board-based Role-Playing Games. There will be a Magic: The Gathering Free Play Tournament on January 25th: All pre-registered attendees will receive a free deck to play with. A Zombie Survival Seminar on January 4 will teach you how to survive a Zombie Apocalypse or other disaster situation. Visit the website or Teen Facebook page for more details about teen programs at Covington, Erlanger or the Durr Branch in Independence. Teens and their parents are encouraged to get to know the teen programmer at their Library. Feel free to ask to meet Erin, Jessy or Eden while at the branch or shoot her an email. What is your favorite teen program or YA book?